Deep green leaves with fragrant white blossoms abound in the early spring, followed by a prolific fruit set enjoyed for months in many culinary delights! This tree will thrive indoors through the winter with natural light and then moved outdoors again in the spring and summer. Note: Lime Trees cannot be shipped to California, Texas, Arizona or Louisiana. Measures Approximately 40" Tall. Size May Vary. if ordered by 9:30 am EDT Tuesday April 23rd. Persian Lime Tree is a hand delivered gift. These gifts are delivered by one of our local design centers located throughout the United States and Canada. Same day delivery is available for most gifts when ordered before the cutoff time. 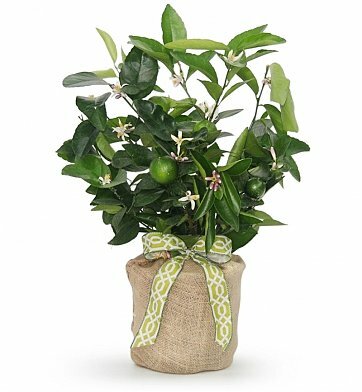 The cutoff time for Persian Lime Tree is 6 AM in the recipient's time zone. Persian Limes are known for their fragrant blossoms and aromatic fruit. Persian Lime Tree arrives in pot shown.